I’ve provided some links here, but there are many more in the earlier posts. The short story is that Labor is taking out of the electricity system about $3 billion for general revenue, compared to the $5 billion the LNP were taking in 2014-15. The price for Queensland is rounded up. Tasmania is not comparable, because they had a hard time in 2016, with the interconnector to Victoria down for months, and a dry winter, adversely affecting their hydro. They had to bring in diesel generators to get by, so the base for the 2% increase was already high. Holding increases to 3.3% in Queensland was already a fine effort, and happened because of government action. However, the Labor government had also taken a further range of actions around mid-year which were not reflected in the official 2017-18 pricing. The Qld Competition Authority early in June determines the standard offer for SEQ for the next financial year, which then becomes the price paid through Ergon in regional Queensland where there are no private retailers. In practice there is a subsidy of $600 million provided to regional consumers, which I understand is in effect paid by consumers in SEQ. The Palaszczuk government got Acil-Allen who do the work on pricing for the Qld Competition Authority to take a look at what the effect of the measures taken should be on electricity bills. 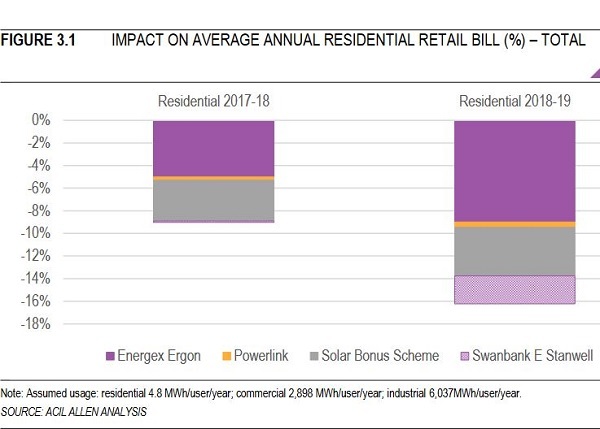 Acil_Allen found that there were savings in the system equivalent to 16.1% of the residential bill which the retailers were trousering. Palaszczuk called the retailers in and threatened to start up a government retailer if they didn’t pass on the saving and show it on the bills. That has worked. 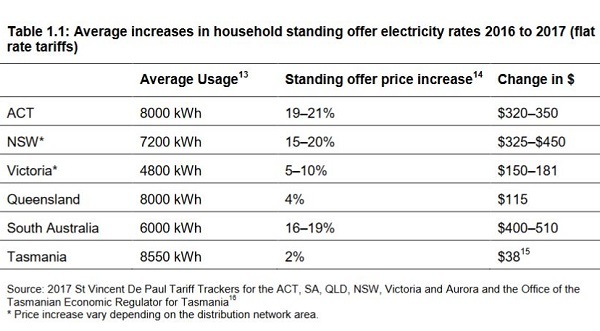 As you can see, the savings are $210 pa by 2018-19, but all that got through to the media was a $50 rebate. For the future, Labor is promising to hold any rises to the CPI, whereas the LNP simply has a vague promise to keep prices down. 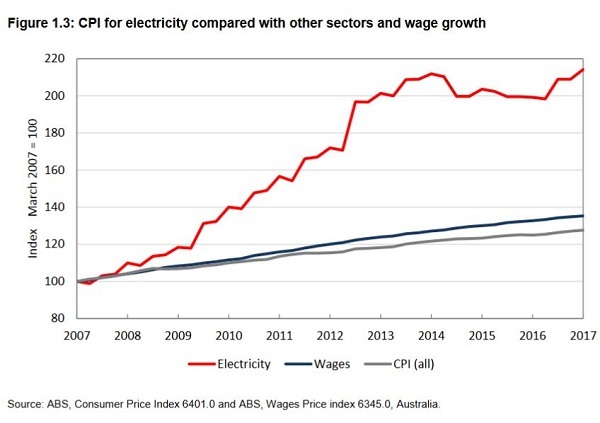 Labor claim that prices rose by 43% under the LNP, but only 1.9% per annum under Labor. This claim has been made repeatedly, and in writing, but no expert I am aware of has critiqued the claim. There are some problems with the ACCC information, but the shape of the graph is probably right. The Newman government was in power from early 2012 to 2015. The national carbon price had an effect, but when Abbott eliminated it prices returned to a point that still revealed an upward movement. Nichols is apt to say that prices doubled in the last 10 years and are now at all-time highs, which is fatuous and misleading. Prices of many things are at all time highs. 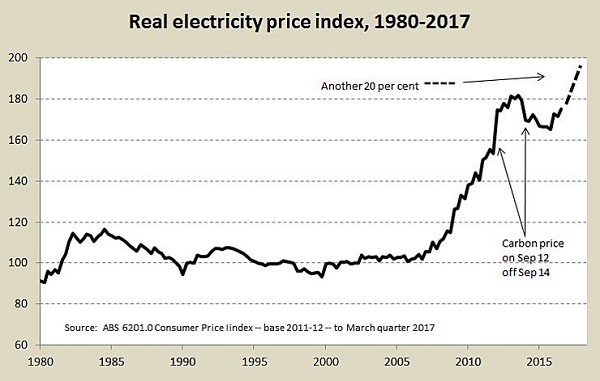 Sarah Elks in the OZ (pay-walled – Google her name and ‘Rising power prices and energy security will be a key policy battleground during the 28-day Queensland election campaign’ if you have a sub) reports that the LNP alleges wholesale power prices have spiked 60% under the Palaszczuk government. 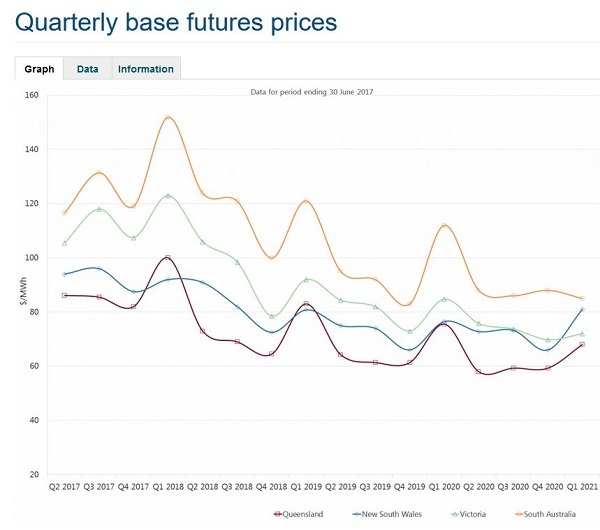 It’s true that the spot market in Queensland went a bit crazy over the recent summer when Queensland became the electricity generator of last report in the NEM almost continually exporting power to NSW, a hot summer led to higher than predicted demand, and on one occasion five coal-fired power stations partly failed in the heat. However, the actual spot market and spot futures for Queensland are now the lowest in the NEM. The same summer situation is unlikely to re-occur because of re-opening Swanbank E and a raft of measures I detailed in Queensland powers up for a warm summer. The LNP’s major promise is to initiate building new coal-fired power station in north Queensland. Nichols reckons he’ll have the processes in place within 90 days. What he is not saying is that it will take 7 or 8 years to be built, so it opens in the mid 2020’s when on present forecasts storage through batteries, pumped hydro, molten salt or whatever will be cheaper and quicker to build. 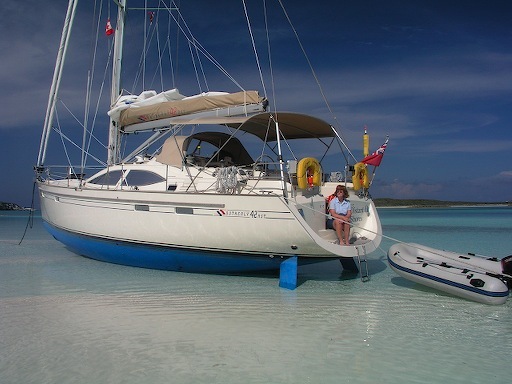 Also there is a serious issue of the risk of stranded assets. The capital cost of coal-fired power is normally spread over 40 years. The world is accepting already that we need zero emissions by 2050. In fact the problem is much worse than that. Around 2015 the IEA told us we should build no new coal generation after 2017. I think that by 2025 the world will realise that you simply can’t go on using this stuff and there will either be regulations or cost penalties imposed to make it difficult if not impossible. Today’s news brings a story that a secret government report splashed on the front page of the Courier Mail which reportedly found that the NQ coal-fired power station was doable and would bring power prices down. I heard Mark Bailey say he didn’t know about it until yesterday. Palaszczuk refuses to say whether she knew, but now says it has been released, but it has been cherry-picked, go read it. I might do that, but for now everything I said above remains true. Also in the earlier post I pointed out that Jim Soorley, who is on the CS Energy Board, reckons that CS Energy did the numbers and they don’t add up. CS Energy lives in the real world, so I’d tend to think they know what they are talking about. I’ve set up a tag Austin_Steve and I’m sorry, if you want the full story you’ll need to read four longish posts. He started by interviewing Mark Moore, CEO of CS Energy and Mark Bailey, the Qld energy minister, in July and then used Rod Sims to undercut them, saying over and over that the Labor government has a secret taxation agenda with electricity which is bleeding consumers dry and Queensland prices are the highest in the country. Sims of course, did not have detailed information on Queensland, and for example has no idea of the challenges of weather, topography and foliage growth in running an electricity network in Queensland, but has a neoliberal agenda which favours privatisation and competition. If these policies are not producing the right outcome, you just need more of them. More recently Austin has been trying to hold the Qld govt to account when he hasn’t done his homework on the issue at hand. I’m not going to repeat it all here. It has become ugly, to the point where Queensland ministers, justifiably I think, are clearly reluctant to go on the program, making it impossible for his program to provide fair and balanced coverage of the election. I think he should be benched for the period. Meanwhile, as I reported in the post Electricity bills – Queensland acts because it can, there are serious questions about the accuracy of ACCC information in its report. The average Queensland bill at $1955 is about $600 more than I found from two other sources.The ACCC did not verify the information by surveying actual bills. In thinking about this, I wonder whether they have taken country network costs, which are subsidized befiore they are charged, and smeared them across the state. Or perhaps the reverse with retailing, as Ergon carries the functions of sending out and collecting the bills in the country. But there is a problem more generally, as the Thwaites inquiry in Victoria found the costs of retailers acquiring and keeping customers was part of the retail charge, but exceeded the benefits of competition. Prices were on a downward trend before we started down the road of privatisation and competition in the mid 1990s. The NEM became fully functional from about 2009. 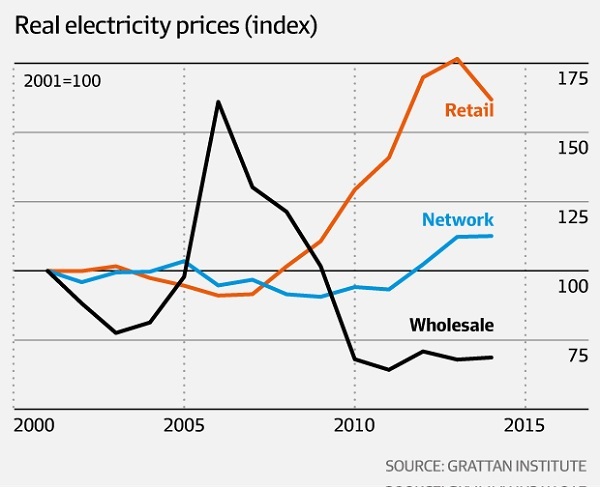 Networks are way less than the 50% found by ACCC, and wholesale, the actual electricity, is minuscule. The more you delve into the electricity industry the more complex it becomes. I doubt anyone understands it completely. Meanwhile you can cherry-pick information to say almost whatever you like. Update: On the mysterious report on a new coal plant in North Queensland, the Brisbane Times reports that the report was commissioned in February, done by consultancy firm Energy Edge, and delivered on 21 August. It would also need to stay open for 30-40 years and would become unviable if a price was put on carbon. 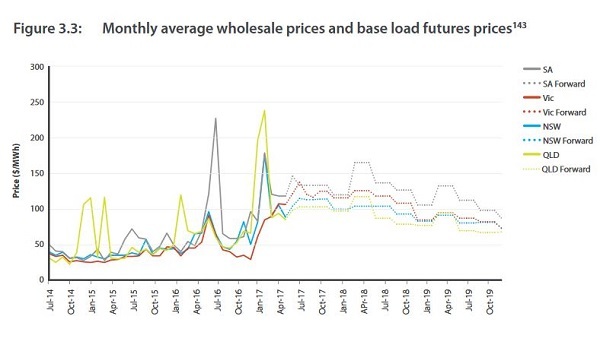 it is not viable if the wholesale electricity price drops to last year’s average wholesale price of $59.99, the Energy Edge consultants report makes clear. “The ultra super-critical coal-fired power plant is only viable under high price scenarios where the wholesale price is maintained at $75 per MWh,” it says. Queensland’s wholesale electricity price in 2017 according to the Australian Energy Market Authority is $93.12, but in 2016 it was $59.99 per megawatt and was $52.15 per megawatt in 2015. ABC Online and Sky News also did a reasonable job of telling the truth, but all day the ABC radio newsroom was spruiking the LNP playsheet. On the northern coal-fired power station, I believe the Greens or greenies or both should be protesting this one with the LNP if they are truly concerned about the Great Barrier Reef, rather than just knocking off Jackie Trad in South Brisbane. I agree that losing Jackie from a Labor government is a real loss. However, she should have been moved to a safe Labor seat once the implications of the Jonathon Sri win sank in. John, rationally I could agree with all that. The brutal reality, however, is that Green action against Trad and the opportunity cost of not attacking Nichols is making a Nichols/One Nation government more likely. Is that their first priority? Brian: Labor benefits from strong Green campaigns. You can’t really expect the Greens to go soft on a party that seems to be supporting Adani to the extent of spruiking their questionable job claims. 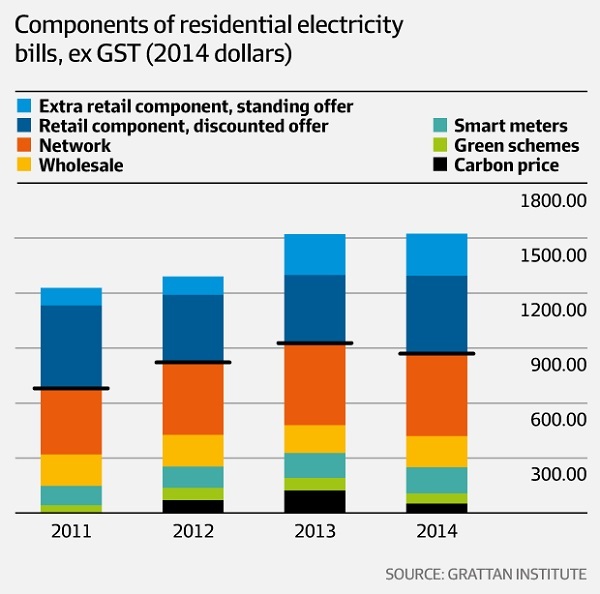 How will a new coal-fired power station bring down electricity prices? Dr Finkel’s report says LCOE for ultra-supercritical coal-fired power station is $81/MWh. The numbers don’t stack up! John, for the longest time I’ve had to put up with greens spruiking that the biggest threat to the GBR was farm runoff. I wanted to yell, it’s the fricken emissions, stupid, we’ll cook the reef, or acidification will make it crumble. They woke up after it happened. Adani is shite and shouldn’t happen. However, to go for Trad is political opportunism dressed up as principle and the high moral ground. If it works they’ll say, sorry we cut off your right arm, but can’t we all be mates and get on with it? The greater priority now in energy policy should be to promote the use of renewables and stop coal. The action taken by the greens is likely to give us the reverse, as an image of a hopeless government that fell into power by accident and isn’t capable of doing anything useful is promoted. Adani would like nothing better than for Palaszczuk to pull the plug. He’d sue for billions. Only problem is that if she pulls the plug she sure as hell will lose the regional seats she needs to remain in government. So whose side are the greens really on? Geoff M, either the report is the one done by CS Energy that Jim Soorley referred to and is badly misquoted, or it was a bogus, low quality report that the department decided to put in the bottom draw. I also found that 20 out of 22 retailers signed the pledge to pass on the savings on their power bills. Also Ergon has a new Easy Pay Rewards, which offers discounts of $75 for regional households and $120 for regional businesses who agree to pay their bills weekly, monthly or by direct debit. Brian: The Greens will support a Labor government. It doesn’t really matter whether Green or Labor win South Brisbane when it comes to blocking a LNP/One Nation Government. What am I thinking about all of this? Let me try thinking again! That’s a little more concise. John, my missus has been doing phone calling for a Labor candidate. Not all the prople turning off Labor over Adani are going to the Greens, and preferencing is then a bit of a lottery. Also it puts the Labor government generally in bad odour. Yesterday I heard a vox pop thing where an ABC ran inti a barber shop in Ipswich, where she met some clowns who were going to vote ON as a protest vote. So, the interviewer said, you don’t mind then if the LNP governs with the help of ON? No, they said, we are not voting for that. We just want to protest. Logic doesn’t have a lot to do with how many people vote. Hijacking media conferences is also preventing Palaszczuk from getting her message through about other issues. Why oh why did she get involved with Adani? It would be a cruel irony for the protest voters if the LNP went ahead Adani anyway. What is the probability of that happening? BilB, the die was initially cast when Greg Hunt approved the project in 2014. Newman LNP was in power here 2012-15. So it was a legacy issue. At no point did the Palaszczuk government have a realist capacity to pull the plug, unless she had big bucks to spend on compensation. Greens being in parliament would have changed nothing. Palaszczuk got involved with the $600 million royalties holiday, to be paid in full eventually. Seems many in the Labor cabinet, including Trad and Palaszczuk were reluctant on this. So not sure what the real story is. It was said not to be a game breaker if she didn’t. OTOH the $900 million railway help from the Northern devt fund probably is. Adani seems he might get Chinese money. LNP Nicholls is in full support, although many graziers are not. I’m going to do a post on Adani next, but it seems that no net extra emissions from Australia coal will be caused, as Galilee will come at the expense of growth in exports from Hunter Valley, Bowen Basin etc. So a protest vote against Labour on Adani is a fools venture? Watching from afar, a few southerners are sceptical thst even one tonne of so-called “Adani coal” will ever be exported. Has anyone reported “Adani” to that website called Scamwatch? Brian: In terms of who forms government, it doesn’t really matter whether Labor or the Greens win South Brisbane. The same could be said for a whole range of seats. It does not surprise me either that the Greens are making advances at the expense of Labor in seats like South Bris that are being taken over by educated, leftish middle class trendies. On the other hand I would expect Labor to easily beat the Greens in more traditional Labor seats. It is also worth noting that experience in other states suggests that the Greens have got a better chance than Labor of winning traditional conservative seats. The reason here is that many conservative voters in these seats are unlikely to give Labor either their first or second preference because of an ingrained opposition to Labor and its association with the unions. However, the Greens are educated middle class like most of the LNP supporters so a protesting LNP voter will be a lot more comfortable giving first or second preferences to an educated middle class party like the Greens. A strategically minded Labor voter in one of these electorates might work hard to reduce the LNP vote while actually voting Green. She’s been there 40 years, knows and loves the place. That’s why she hasn’t moved to a safe electorate. What you are saying is that hijacking the election and making it about Adani when we should be talking about $3.4 billion of renewable energy started or under way with more in the pipeline, and the other lot walking away from clean energy and building a $2 billion coal-fired plant. Knocking off Jackie Trad is the single most important thing to be highlighted above all others. There was one article in the AFR today that mentioned the Qld election. It said that Adani had become an election issue, and that a study had revealed that a northern coal-fired power station was a viable option. Paluszczuk has had to write off the first four days of the campaign, because she’s been crowded out, by Adani, and yesterday it was $1 dollar transport everywhere, and today 45 million animals being killed each year through tree-clearing. The latter was the latest effort in greenies (I think she was Wilderness Society) telling everyone how they should lead their lives and do their business. Politics is the art of the possible, and Labor pulling the plug on Adani is not part of the possible. We need to talk about Adani, but it’s not what the election should be about. Brian: As someone who has moved from place to place over my lifetime I get pissed off with the idea that Parliamentary places should be reserved for those who can claimed to have lived in a particular electorate most of their life. People who have moved have something to offer too. John, I grew up in one place for 13 years, then went to boarding school, then moved 13 times in about 24 years. Now I’ve been in the one place for into the fourth decade. I’m not saying a place should be ‘reserved’ for Trad, simply that she knows the place, loves it, and would probably choose to stay there rather than save her political hide. I’ll take the issues briefly one by one. I’d be interested in whether you had anything to do with the transport plan. On the surface it sounds hopelessly impractical because it couldn’t be funded. The vegetation management issue was discussed without reference to political party policy, implying both majors were hopeless. It’s a complex issue where the proper balance is hard to find. LNP made it far too easy to clear. Labor has a policy that leans too far in the greens direction, but couldn’t get it up because of Katter Party opposition. I didn’t get the post on Adani finished last night, because when I looked into it a bit further hand granades were going off all over the place. The truth, and I think I’ve gotten close, is ugly, but the fact remains is that if the Greens knock off Trad it will make no difference. The only politician who can pull the plug on Adani and still be elected is Bill Shorten. Di Natale should be shirt-fronting Shorten about it. However, no politicians, including Greens are properly appraised of the state we are in over climate change. If Di Natale was then we’d be hearing from him about it at least once a week. On the state level, knocking off Trad will make no difference to what happens – none at all. So it remains a political exercise, not a policy exercise that will make any difference. They are not even adding to our understanding of the issue, which is often the value of the Greens. Have to go out and work now. Adani is shite and shouldn’t happen. Senior officials considering lending public money to develop Australia’s biggest coal mine have known for months of environmental and financial concerns surrounding the proponent Adani, internal emails reveal. Any thoughts on why the NAIF is still considering an Adani proposal (according to confirmation by the NAIF CEO at Senate Estimates on Thursday evening, Oct 26)? What does the NAIF know that we don’t? a few possibilities occur to me. 1. The CEO is holding cards close to chest? 2. NAIF are yet to announce results of deliberations, and promised all applicants that the decisions would all be announced at one time, not dribbled out piecemeal…? 3. If 2. were true, it might have something to do with “market sensitivity”, i.e. effects on share prices? 4. NAIF reports first to a Minister, then to the general public? 5. NAIF reports first to the House of Reps? 6. A final decision on Adani cannot be made while the Qld Govt is in “caretaker mode” [do they have that in Brisbane?]? of course, it may well be none of the above; what would I know??? Brian: It would be better if Anne Macmahon were to replace an LNP MP or some Labor MP who is contributing far less than Jackie. But don’t ask me to support the idea of the Greens declaring Jackie to be a koala bear and withdrawing Anne’s nomination. John, I’m not asking you to do anything, just commenting on the politics of it all. You did say that Labor should have moved Trad to a safer seat. I’m suggesting that Trad, having lived her whole life where she is didn’t see that as an option. Politically it probably wasn’t. She would have looked as though she was moving to save her skin and that’s exactly what it would be. She would have lacked credibility in the new electorate. Stephen Miles, as you would know, did a runner from what looked like too hard a contest in Indooroopilly after the change in boundaries. But he moved to the place I understand he grew up in. We’ll have to see whether that works for him. There have been a few stunners today, but the last was Palaszczuk announcing that she would veto the NAIF loan to Adani. An issue about her partner’s work for Price Waterhouse on the Adani loan and conflict of interest. Apparently she doesn’t talk to her partner about his work and only knows what he’s doing by asking her chief of staff, David Barbagallo. She’s clearly not a fool, and would not have done this lightly. I’m going to have to sleep on that one. Apparently, she can’t veto in caretaker mode without Tim Nicholls signing on, and he won’t. And even if Qld does veto it does not stop the loan. She says she still supports the project, and it’s worth noting that Adani said he didn’t really need the loan. Obviously the optics are important, but honestly it has got me scratching my head. I’d be interested in whether you had anything to do with the transport plan. On the surface it sounds hopelessly impractical because it couldn’t be funded. You seem to me to be falling into trap that a lot of us love to fall into. The trap that says that public transport is not part of an integrated system and it is bad, bad, bad if it doesn’t pay for itself. However, public transport is part of an integrated system where getting more people on to public transport will lead to reductions/delays in the need for road upgrades to overcome the congestion. It is a bit like the logic behind a major grid owner in NSW encouraging rooftop solar and energy efficiency improvements to avoid the need for expensive grid upgrades. In the past I found that it was often cheaper to use many already owned cars driver only for commutes than public transport so, if anything, price was a reason to avoid public transport. (It was even cheaper to drive my alto compared to off-peak concession!) Recent fare changes have made things a bit better but not much. How fare sensitive is public transport? Unlike most of the city CBD public + active transport accounts for about 80% of commutes. contributing factor the cost of parking? Trends in Transport Mode Shares for Australian Capital Cities Brisbane, unlike the other Australian capital cities showed a downward trend in use of public transport that corresponded to big fare increases. The NAIF is a federal entity reporting to recently re-appointed Minister Matt Canavan. There may be some sensitivities towards the current Queensland elections. Deliberations by the NAIF concerning projects under consideration remain secret until after a final decision is made. When a decision has been made, the result of the decision must be made public within 30 days. But why continue to consider risking $900 million of tax-payer funding, after the recent ABC Four Corners report on Adani? Does the NAIF know something not public, or do they have their eyes closed to the public allegations? John, the reason I asked whether you had anything to do with the Greens tranport plan is that I would have more default for it if you had answered, yes. I gather the answer is, no. So my first question is this: are we looking at a properly designed and costed plan here, or a thought bubble with a bit of indicative scoping? I looked at the Greens site and found this. That does’t look like it, but Brisbane Times seems to have a handle on it. It’s four zones out as far as Gympie and Toowoomba, and $1 per zone. And the $4 billion is to come from miners and property developers. Remember what happened to Kevin Rudd when he wanted to tax miners more? I have heard others on the radio now point out that public transport is already 70% publicly funded. I’m up for a discussion about congestion taxes and cheap or free public transport. However, I still don’t know whether this is serious policy for implemention in the next term of government, which is what this election is about. I’ve been reflecting on Palszczuk’s intention to veto the Adani loan following an alleged LNP ‘smear’ campaign. That report from the Brisbane Times article was until a few minutes ago the only one I’d seen that wasn’t grossly wrong and misleading. Now there is one from ABC online which is maybe better. It disagrees on one important point. Matt Canavan says the state can veto the deal . He’s probably right. The local LNP are disowning any plans to smear Palaszczuk. I picked up somewhere that the smear plan was being cooked up by federal LNP pollies. There is little doubt it would have been used. Palaszczuk could see herself being dumped on probably late in the campaign the way Hillary Clinton was. So she decided to lance the boil, partly as a preemptive action, partly to show that she was in fact independent and not owned by any outside interests, partly so that we could go on and talk about other issues in this campaign, and partly to try to save Trad’s seat. The Courier Mail actually has some intelligent political commenters (and some others not so), who gave the first week easily to Tim Nicholls, partly because of the Adani thing shutting Palaszczuk down and partly because of his promises everywhere, doubling a rail line to Nambour, duplicating the MI from the Cold Coast so that if you live at Jacobs Well you can get home faster (for those who don’t know the geography, the road will only duplicate 20% of the distance) and most of all a new coal fired power station and 10 new dams from Rockhampton north. When he gets to explain where the money comes from it will be from renewable energy subsidies and initiatives, and cancelling cross-river rail (Trad’s electorate). Meanwhile he got another free kick from the Greens proposal for four new public holidays. They would include include one for the third State of Origin, an International Women’s Day, a National Parks day and a day during NAIDOC week of significance for First Nations communities in Queensland. They want to talk about it, but no mention of Australia Day or Queens Birthday. Emma Griffiths on ABC local Drive tried to have a conversation, but no-one was much interested. In the end it became a bit of a joke, starting with the news reader who suggested St patick’s day, which happened to be his birthday and ending with her assistant producer, who said everyone should get a holiday on their birthday. One woman running a business rang in saying, who do you think pays people on these days? One bloke said he nearly pissed himself laughing and asked, is this what a proper political party would be asking before an election? Seriously, it’s supposed to be about work-life balance, but Nicholls was out there saying “more loopy policy from a loopy party”. Next he will be saying, if you vote for Labor you get the Greens, which he already has, but you can bet he’ll preference the Greens above Labor in Trad’s seat. Palaszczuk I think desperately wants to keep the Greens out of parliament. On Adani, I think Nicholls is right, Labor is internally split over Adani. The left don’t want it, the right do. The left, which includes Palaszczuk and Trad, oppose it. The left are dominant, but were persuaded by the right that if you want to stay in power that is how it must be. Di Natale is claiming it as a win for his Greens, (RN Drive, I think) but at what price? Two things matter in this election, renewable energy/climate change and regional jobs. As I detailed in this post Queensland is doing an incredible job on renewable energy, which brings many jobs to the regions, but the story is not getting out there at all. Natlale’s Greens may have ensured that the story remains hidden, and as we stand right now, that the LNP regains the Treasury benches. As they were saying in the CM, the party that wins the first week does not always prevail. We can only hope. Palaszczuk said she learned on Tuesday of “a rumour circulating among LNP senators” about Drabsch’s work as managing partner for PwC, which helped Adani with its Naif loan application. “I am told they planned to use this during the election campaign to impugn my character and suggest something untoward,” she said. Palaszczuk’s chief of staff David Barbagallo told her on Tuesday that he had, after becoming aware of “rumours being circulated by LNP senators in Canberra”, confirmed that Drabsch worked on the Adani bid. Palaszczuk said the LNP senators “obviously” sought to “break that commercial in confidence” around Drabsch, saying the extent of knowledge about this was a matter for both Turnbull and Nicholls to address. Efforts to discredit her would involve “trying to allege there was a massive conflict of interest and seeking to tear down my position as premier of this state and tear down my integrity and honesty”, she said. “I’m putting on the record every step I have taken and to put beyond any doubt about this, we will veto that loan. “I entered politics to make a change, I actually want to make a change to people’s lives, not to be smeared at. In doing what she did she went well beyond what the integrity commissioner advised. So she showed some bravery, it seems. Seems the protesting is being done by the Stop Adani Alliance, which started with 13 members, and now has 31. They never put dates on these things, but it was launched by Bob Brown. Comments on that thread go back at least 7 months. There is also a #STOP ADANI site. They had a national day of action about a month ago. Last Friday they blocked up Albo’s office. Not that it bothered him. He was leading a parliamentary delegation in India, probably the one Pauline was on. It’s all very admirable, but protests don’t always change anything. This time the Greens latched on to do some politics. It will have effects, which presently are unpredictable. You are right, Labor does have a good story to tell on renewables in terms of reduced power bills, cleaner energy and jobs. It should get on with this. Both Labor and the Greens should be proposing solar tower investment in Nth Qld to counter the silly LNP proposal for a new coal fired power station. A key point about solar towers is that they have similar characteristics as coal fired power stations which gets rid of the technical arguments er coal fired helping to stabilize the power system. 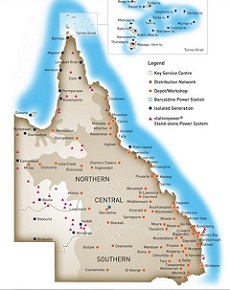 John, here is the official Powering North Queensland statement with 11 projects. There is also a hydro study, which would no doubt come up with pumped hydro options. The Burdekin Falls dam upgrade with hydro is also important. I don’t see there the Kennedy Energy Park project, with solar wind and battery, which has actually started. Thing is, no-one seems to know about this stuff happening. The transport policy you found on the website falls into the second class, a policy I had nothing to do with. The policy outlined in the Brisbane Times is the policy that is being taken to the Qld election. Keep in mind that, like the transport policy taken to the council elections it is designed to help the Greens win the inner city electorates where they have a real chance, not “regional” electorates like the ones we live in. What I saw in the Brisbane Times article looks like a rerun of the council policy with the addition of the fares policy. I was actively involved in the development of the council policy and argued unsuccessfully at the time that we needed significant fare cuts and medium frequency feeder bus routes if we were serious about moving people from commuting using driver only family cars to public transport. (Essential if we are serious about congestion and emissions.) I was talking about other ways of reducing fares but the $1 fare proposal is large enough and simple enough to be a real game changer. In terms of loopy transport policy we live in a city where all the toll roads, tunnels and bridges are congestion bypasses while no tolls are charged for driving in congestion areas. This strange loopy policy has been supported for years by both major parties. It is also worth noting that there are already free buses and ferries in the CBD area so why not a fare cut for the peasants from the rest of Brisbane? John, first up, Palaszczuk’s so-called ‘backflip’ on NAIF funding of the railway (I think she always said that taxpayers’ money should not be used, but I’d have to check that) has allowed some cabinet ministers to state in public their opposition to the whole mine. So far I’ve heard environment minister Stephen Miles and energy minister Mark Bailey make public statements. Our local member, the Newman-killer Kate Jones, has long been telling anyone who asked that she’s against it. On the transport plan, if you had something to do with its genesis then I have more confidence. As explained on the radio by Amy MacMahon it sounded like state-wide, and she said the plan had been fully modelled. I think there should be a difference between a plan and a policy. Political parties don’t have the resources to develop plans. So any specifics, like the $1 fare, should be labelled as aspirational, not as plans to be implemented. Both Labor and the Greens should be proposing solar tower investment in Nth Qld to counter silly LNP proposal for a new coal fired power station. A key point about solar towers is that they have similar characteristics as coal fired power stations which gets rid of the technical arguments er coal fired helping to stabilize the power system. Out of a number of potential high insolation sites, 12 have been chosen: Mildura (VIC), Moree (NSW), Bourke (NSW), Dubbo (NSW), Broken Hill (NSW) Port Augusta (SA), Carnarvon (WA), Kalgoorlie (WA), Longreach (QLD), Charleville (QLD), Roma (QLD) and Prairie (QLD). These selections are a good solution taking into consideration the factors discussed already. It is possible that with more in-depth multi-variable analysis of the trade-offs between solar resource, transmission costs, geographical diversity and other environmental factors, various different and potentially more optimised scenarios could be conceptualised. There are a few promising sites. Ideally, the CST proposal should not be an orphan project, but the start of a bigger master plan. The South Australian Aurora CST project is 150-megawatts with 8 hours storage, contracted to supply energy at or less than $78/MWh. The Queensland CST proposal, if it can get up, should ideally be more ambitious and have more storage (15-17 hours) to provide greater flexibility to operate around the clock, rather than just as a “peaker”. If the proposal could provide energy at or below $80/MWh for ‘dispatchable’ plus 24/7- ‘baseload’ electricity I think it would outcompete (on emissions, economics & performance basis) with any new ultra-supercritical coal-fired power station. Brian’s above update highlights that “The ultra super-critical coal-fired power plant is only viable under high price scenarios where the wholesale price is maintained at $75 per MWh”, and that’s without any carbon pricing. But don’t be surprised if the coal lobbyists begin fighting dirty and telling lies to try to stop this idea getting any traction, let alone actually happening. Geoff: I think the important thing about solar towers is that they come with backup molten salt heating to allow them to produce 24/7 if required no matter what is happening to the weather. Molten salt heat storage is pretty cheap so longer storage will reduce the need for back-up. My recollection is that the BZE talked about 3 days storage. My recollection is that the BZE talked about 3 days storage. BZE’s Stationary Energy Plan says: 220 MW gross / 217 MW net generating capacity with 17 hours thermal storage at maximum rated generating capacity. The molten salt storage, tower heat exchanger and the heliostat array are an up-front capital cost, with minimal recurring costs other than maintenance. The backup molten salt heating uses pelletized crop-waste fuel, which would be an ongoing sizeable recurring cost, but only if consumed. It’s a contingency for bad weather – days of low insolation – but estimated to contribute at most only 2% of annual energy. That’s the modelling theory. Part of the BZE plan strategy is to rely on networking all generating sources, drawing on wind as first priority as it is available, then utilize the ‘dispatchability’ capability of solar thermal to fill in the gaps to meet network demand. I would expect a different strategy is required with an “orphan” generator. That’s why a long-term master strategy/plan is required to maximize efficiency for the network. Piecemeal ends up costing more in the long run.